Department of Mathematics, Institute for Advanced Studies in Basic Sciences, P.O.Box 45195-1159, Zanjan 45137-66731, Iran. We construct a noncommutative analog of additive functional equations on discrete quantum semigroups and show that this noncommutative functional equation has Hyers-Ulam stability on amenable discrete quantum semigroups. The discrete quantum semigroups that we consider in this paper are in the sense of van Daele, and the amenability is in the sense of Bèdos-Murphy-Tuset. Our main result generalizes a famous and old result due to Forti on the Hyers-Ulam stability of additive functional equations on amenable classical discrete semigroups. E. Bèdos, G.J. Murphy, and L. Tuset, Amenability and co-amenability of algebraic quantum groups, Int. J. Math. Math. Sci., 31 (2002) 577-601. M-E. Craioveanu, M. Puta, and Th.M. Rassias, Old and New Aspects in Spectral Geometry, Kluwer Academic Publishers, Dordrecht, Boston, London, 2001. E.G. Effros and Z.-J. Ruan, Discrete quantum groups $I$, the Haar measure, Int. J. Math., 5 (1994) 681-723. M. Enock and J.-M. Schwartz, Kac algebras and duality of locally compact groups, Springer-Verlag, Berlin-Heidelberg-New York, 1992. G.L. Forti, The stability of homomorphisms and amenability, with applications to functional equations, Abh. Math. Sem. Univ. Hamburg, 57 (1987) 215-226. D.H. Hyers, On the stability of the linear functional equation, Proc. Nat. Acad. Sci. U.S.A., 27 (1941) 222-224. S.-M. Jung, Hyers-Ulam-Rassias Stability of Functional Equations in Nonlinear Analysis, Springer Optimization and Its Applications, New York, 2011. J. Kustermans and S. Vaes, Locally compact quantum groups, Ann. Sci. École Norm. Sup., (4) 33 (2000) 837-934. C. Mortici, M.Th. 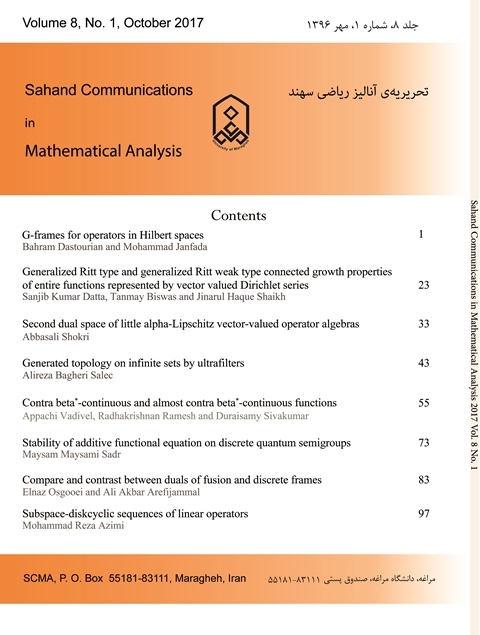 Rassias, and S.-M. Jung, On the stability of a functional equation associated with the Fibonacci numbers, Abstract and Applied Analysis, Hindawi Publishing Corporation, Volume 2014 (2014),Article ID 546046, 6 pages. A. Pràstaro and Th.M. Rassias, On Ulam stability in the geometry of PDEs, In: Functional Equations, Inequalities and Applications, Kluwer Academic Publishers, Dordrecht, Boston, London, 2003, pp. 139-147. S.M. Ulam, A Collection of the Mathematical Problems, Interscience Publ., New York, 1960. A. Van Daele, Discrete quantum groups, J. Algebra, 180 (1996) 431-444.